Search-form presets - search for available 'economy' and 'compact' cars at the rental location 'Budapest - Airport'. Address: Terminal 1, Ferihegy 1, Budapest, Budapest, Hungary. You can also select any of the 11 available rental locations in Budapest using the white search form, or change the class of the desired low-cost vehicle to 'Mini' or 'Compact'. If your budget is limited, it is better to book a car in advance, since rental rates increase with decayed availability of vehicles. Quite often, the cheapest options of golf-class cars in Hungary can be found in airports. The most popular models representing the mini, compact, and economy car segments in Budapest are: Toyota Aygo, Hyundai Atos, Ford Fiesta, Hyundai Getz, Peugeot 207, Toyota Yaris and others. When hiring a budget hatchback, it is definitely worth saving on insurance deposit (franchise). Deposits on small cars in Hungary vary from 100 to 1.000 euro/dollars. Check the rental conditions of each car in your selection to find a vehicle with a minimum deposit. If your routes in Hungary are foreseen to pass through hilly areas or mountains, it is not recommended to consider very small cars for rental. Their engines are usually insufficient for a confident driving on the roads with long or steep climbs. At the rental office in Budapest, consider to take a 'Breakdown Assistance' package or ask an officer for a contact data to use in case of a vehicle breakdown. Cheap cars are sometimes unpredictable in operation. 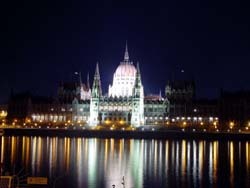 OrangeSmile.com wishes you a safe and great trip to Budapest! Local police have the right to charge fines right on the spot. With rare exceptions, foreign motorists are allowed to pay the fines later, using the fine receipt. The total length of roads in Hungary is a little less than 160 000 km. Almost half of the roads has high-quality surface. It is possible to use some roads only after you have purchased the e-vignette. Note, if the road is paid, the presence of the vignette is strictly controlled. As a rule, these vignettes are sold in special ticket machines and retail stores. The exact value of the vignette depends on the type of the vehicle. Car drivers are able to buy the vignette for 10 days, one month or one year.